Major road improvement works, on one of the busiest routes in and out of Manchester and Salford, are underway. The work will improve capacity by up to 20% at six major junctions in and around Regent Road, reducing congestion and delays. The £15 million Manchester and Salford Inner Relief Route improvement scheme (MSIRR) is being delivered by Manchester and Salford City Councils with funding from the Government’s Local Growth Fund. The work began in August and will last for up to 12 months. During this period there will be a major impact on journey times. The second phase of work has begun on the Chester Road/Mancunian Way roundabout. The approaches leading up to the roundabout have been reduced to one lane and the inner lane of the roundabout is closed. These lane restrictions are in place for the remaining duration of the works. Additionally, work is taking place between junction 10 and junction 12 on the M62 as part of the Smart Motorway improvements. Highways England have provided an overview of the works to help you plan your journey. If you travel or live in this area, please plan ahead and find out how it might affect your journey. Please continue to check this page for updates. Regent Road: It has been reduced from two lanes to one lane in each direction. Access for pedestrians and cyclists will be maintained throughout the works. Chester Road/Mancunian Way roundabout: The approaches leading up to the roundabout have been reduced to one lane and the inner lane of the roundabout has also closed. These lane restrictions are scheduled to last until spring 2019. From Monday 29 April resurfacing works will take place on Regent Road. Access to all businesses and properties will be maintained at all times and diversions will be put in place. Where is work taking place? During the works Regent Road, from Oldfield Road to the Mancunian Way, will be reduced from two lanes to one lane in each direction. 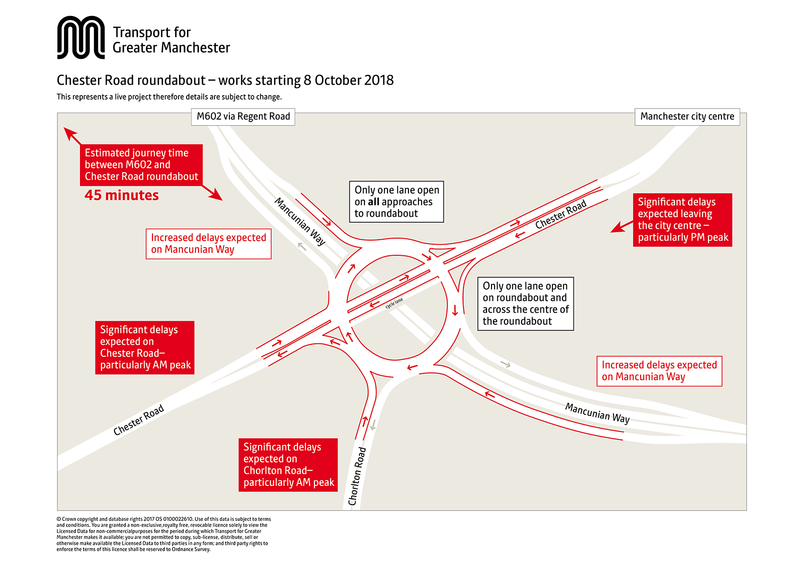 The approaches leading up to the Chester Road/Mancunian Way roundabout have been reduced to one lane and the inner lane of the roundabout is closed. These lane restrictions are in place for the remaining duration of the works. How will it affect my journey? Where possible, road users are advised to look for alternative routes, travel outside of peak times and consider public transport options. People who have to drive into the city should plan ahead, allow more travel time or consider travelling outside peak hours. The work is expected to cause delays on other nearby corridors including the M602 and Mancunian Way, while surrounding routes – such as Chester Road, Princess Road, A580 East Lancs Road, Trinity Way, Hyde Road, Stockport Road and Ashton Old Road – will likely be much busier than usual. During the morning peak, travel into the city centre via the M602, Regent Road and on to the Mancunian Way is expected to increase from around 15-20 minutes to at least 25-30 minutes. During the evening peak, journeys out of the city centre along the Mancunian Way, Regent Road and on to the M602 are expected to increase from around 20-25 minutes to at least 40-45 minutes. Make sure you’ve considered all your options before setting off and allow extra time for your journey. Where possible, please avoid using routes in the affected areas. Using alternative city centre exits from the M60 may reduce your journey time. Where possible, avoid travelling during the morning (7.30-9am) and evening (4-6pm) peak. If you have to drive into the city centre, you should plan ahead, allow extra time for your journey and consider travelling outside peak hours. Where possible please consider public transport options as these may provide faster journey times into the city centre. There are a number of Park and Ride sites across Greater Manchester that provide free and convenient access to both bus and tram services. While the work is taking place, motorists may find it easier to park at one of the following sites and continue their journey by bus or tram. From next week there’ll be a special offer available to all get me there app customers. It’s here to help you get around Greater Manchester in the busy festive period and is available exclusively on the get me there app. You can find out all the information you need here. Etihad Campus offers a free park and ride operation on the Blue Carparks - G unless directed - access via Gate 2 on Alan Turing Way from 6.30am to 6pm on weekdays only. First Manchester have provided additional express services during the morning and evening peak periods to and from the A580 Park and Ride site towards Princess Street in Manchester city centre. This route will be numbered V3, a full timetable can be found here. If you plan on utilising these services, please still allow extra time for your journey as congestion may affect estimated journey times. Many employers now offer flexible working options. If your journey is significantly impacted, could working from home from time to time be an option? TfGM's Sustainable Journeys team work with businesses to evaluate and learn from having better working practices. They also encourage and support organisations that promote walking, cycling, public transport and car sharing to employees. Do you live within three miles of the road works? You may find that local journeys are affected by commuters changing their journey and using local roads. If you are making a short journey, please consider walking or cycling where possible. Our 24-hour control centre will constantly monitor traffic flow on and around Regent Road, and on other affected routes into the city. Where possible, traffic engineers in our Urban Traffic Control Team, will alter traffic signals to improve journey times. We are working closely with Manchester and Salford City Councils to offer up-to-date travel information through our website, roadside electronic signs and social media. Follow updates on Regent Road on Twitter and Facebook.